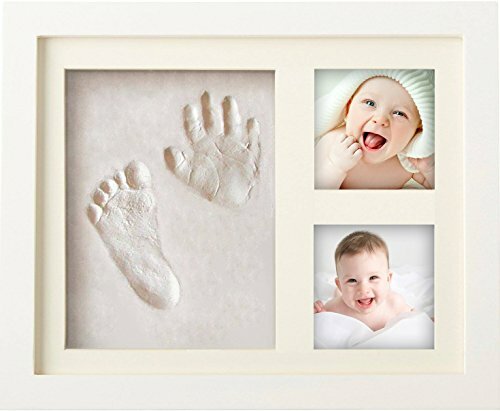 Baby Handprint & Footprint Keepsake Photo Frame Kit - Personzalize it w/Free Stencil! Non-Toxic Clay, Wall/Table Wood Picture Frame. 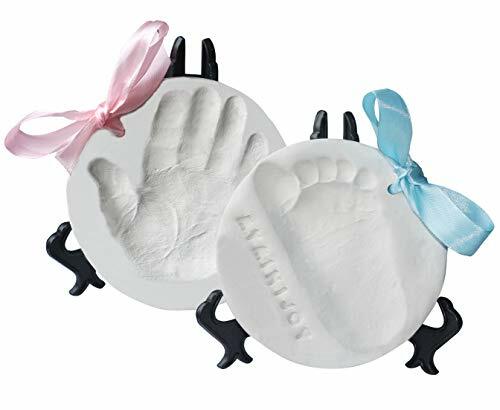 Perfect Registry, Baby Shower, New Mom, Birthday & Newborn Gift! Those tiny hands and feet grow fast. Baby Mushroom's handprint and footprint (or pawprint!) 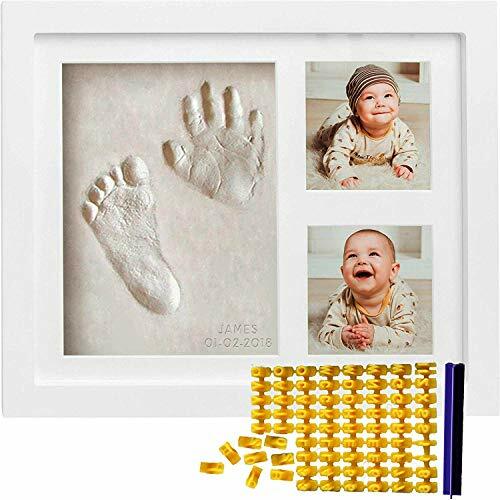 photo frame kit gives you everything you need to make a lifelong keepsake to cherish. 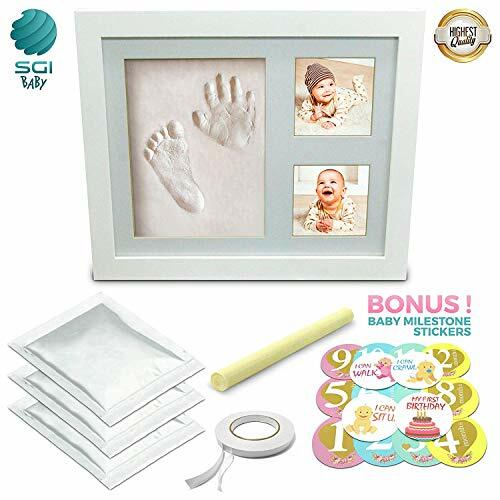 Complete with clay, durable picture frame, stencil kit for easy customization, and other accessories, you'll have something that you can look back on and admire forever. You'll love our fresh, small batch clay. It's safe, non-toxic and made to result in a smooth, hard, crack-free memento - fully dry and ready to hang in about 48 hours. The mold is large enough for baby's hand and foot (or two pet's paws). The wood frame is elegant and durable, and includes both a stand and wall mount. 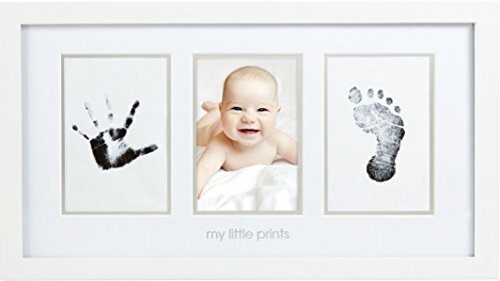 Hang it on the wall of baby's room, on an end table or mantel, or wherever guests are most likely to "ooh and ahh" over it! 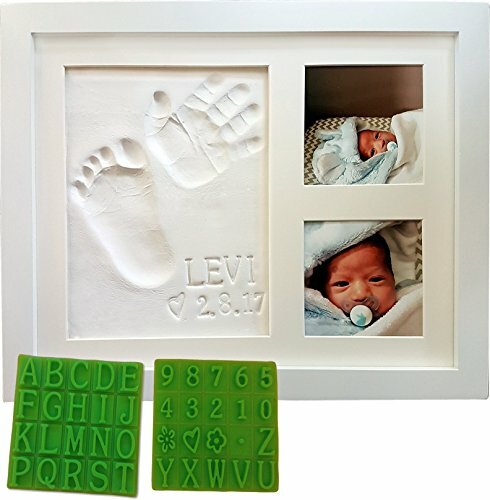 To make your keepsake, simply knead the clay until smooth, place it within the frame, make your impressions, and customize using the included bonus stencil. Choose two pictures to complete your work of art! Our kit gets rave reviews from new parents, grandparents, and proud aunts and uncles. It makes a great newborn or baby shower gift, first birthday present, or holiday stocking stuffer. Size: 15" L x 9" W x 0.8" Hx 9\"
Want more Footprint Gift similar ideas? Try to explore these searches: Navy Blue Chicago Bears Jacket, Inside Window Crank Handle, and Blue Kids Hoodie.